EIRP - effective isotropic radiated power - is an important parameter when calculating both intentional and unintentional electromagnetic emissions. EIRP is a vector quantity that accounts for both power (magnitude) and 3-dimensional coordinates (direction). It includes antenna directivity that concentrates power in a particular direction rather than distributing it equally in all directions (e.g., isotropically). Effective radiated power factors in modulation type and power envelope shape as well. Knowing how to measure that quantities can make the difference between passing and failing FCC (or other countries' spectrum regulating bodies) certification. By Gladden B. Houck, Jr. Maximum effective radiated transmitter power is the aim of all CB and ham radio operators. This is evident from the fact that so much effort and money go into improving transmitter efficiency-matching devices, tuning couplers, SWR bridges, beam antennas, etc. There are many factors involved, actually, in the struggle to get maximum r-f output. Some are more important than others; but all are worth reviewing. To start with, just how does one measure transmitter power output? One way is to use a commercial r-f wattmeter. An alternate method is to measure the voltage generated across a 50-ohm load with a conventional voltmeter using a high-frequency probe that will operate at the frequency of interest. 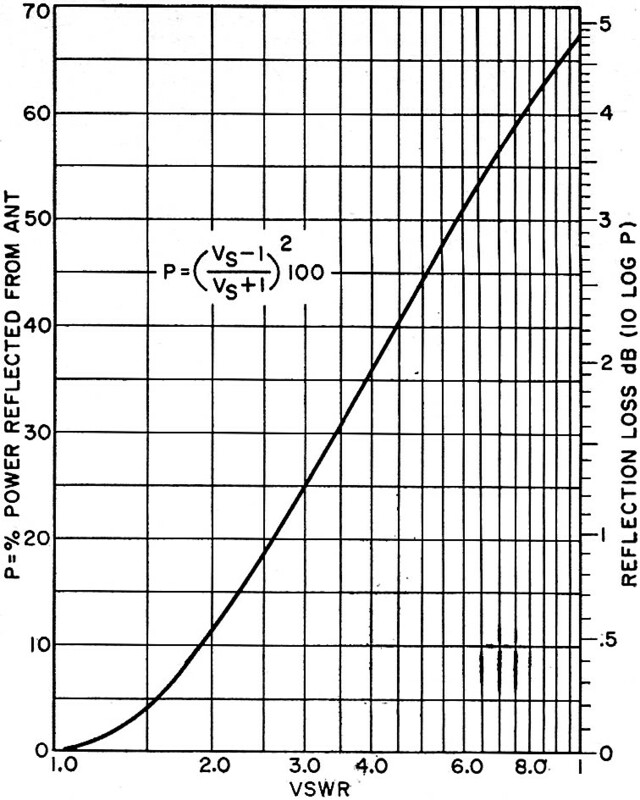 This measured voltage can be converted into approximate r-f power for a 50-ohm load by using the curve in Fig. 1. Fig. 1 - Converting volts to watts and dBW. A less accurate method of determining r-f power output is to measure the dc power (voltage and current) supplied to the power amplifier when it is loaded by the proper antenna and tuned to resonance. The efficiency of this stage can be assumed to be about 60%, unless you have an actual figure supplied by the manufacturer. Thus, if the final stage in a CB rig has about 13.2 volts on the collector and the collector current is 380 mA, the legal dc input rating of 5 watts is obtained. With 60% efficiency, this would result in 3 watts of r-f at the output terminal. To keep all computations in terms that point up the relative importance of any improvement, a dBW rating is used. By using the scales in Fig. 1, we see that 3 watts is equivalent to 4.8 dBW. This approach is based on zero dB for one watt. The least change in dB levels that the ear can notice is about 3 dB (a power level change of 2 to 1). 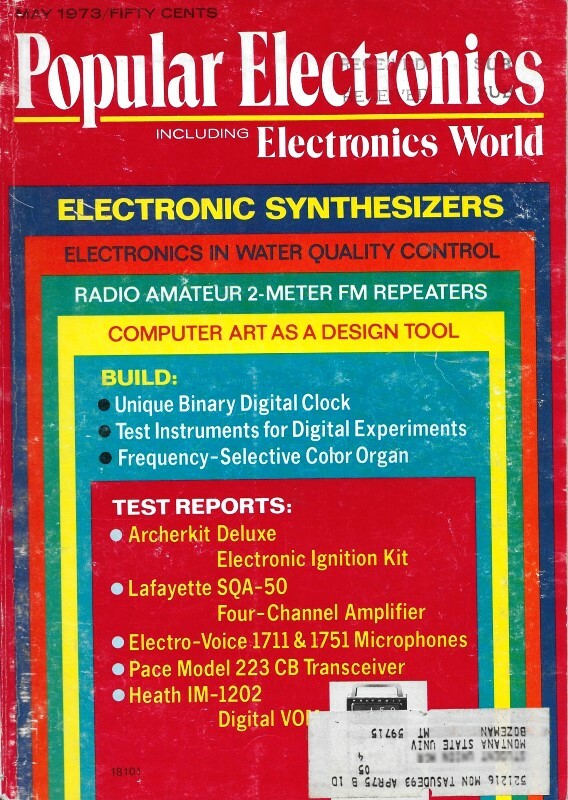 If the transmitter described above had a 100% efficiency, its output would be 5 watts (7 dBW), less than twice the level of the original 4.8 dBW, a barely discernible improvement. Line Losses. Transmission line losses are of two types: direct losses and reflected mismatch losses. Direct losses are easy to determine since they are proportional to the length of the transmission line, and they depend on the type of coaxial cable used. One of the common types of cable employed for connecting the transmitter to the antenna is RG-58/U. It has a loss rating of 0.022 dB per foot. If we assume that a typical base station uses about 60 feet of cable, this means a direct cable loss of -1.32 dB, where the minus sign indicates a loss. Using the same length of RG-8/U cable with a rating of only 0.01 dB per foot, the direct cable loss is -0.6 dB. This shows that the selection of coaxial cable can make a big difference in the transmitted signal level. 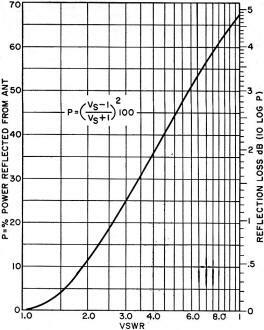 Reflected losses are measured by using an SWR bridge or an in-line wattmeter. The proper place to make these measurements is at the connection between the transmission line and the antenna. Measurements made at the transmitter end of the cable, although valid, are always lower due to the cable losses which attenuate both the direct and reflected signals to the bridge. The chart in Fig. 2 provides a means of converting SWR and reflected power into dB losses. 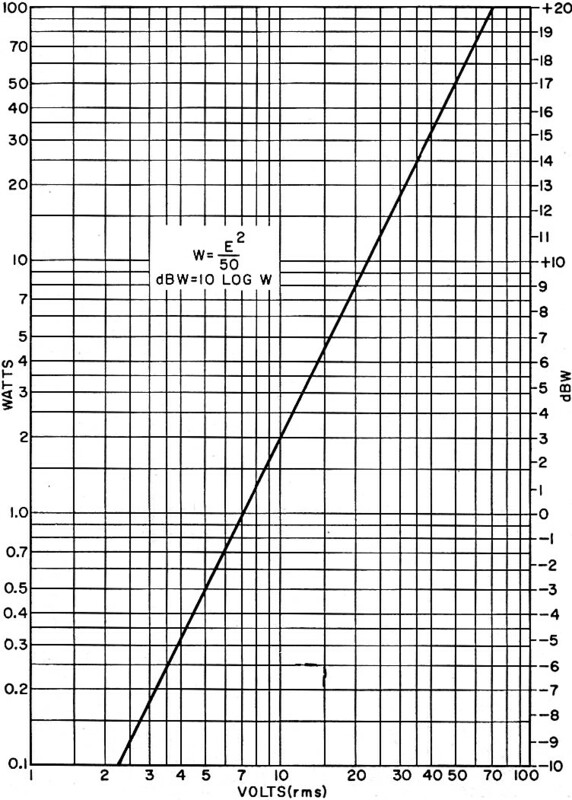 If a typical antenna system has a measured SWR of 2.0, Fig. 2 shows that the loss is -0.5 dB. Fig. 2 - Finding reflectance loss from SWR. Antenna Gain. The gain of an antenna is specified by its manufacturer in terms of dB as compared to a standard dipole. Thus a simple whip antenna about 96" long has a gain of about +2.15 dB, while a multi-element beam antenna may have a gain of +11 dB or more. Since the gain of an antenna is difficult to measure without special equipment, it is usually necessary to take the manufacturer's word for it. If we assume that a rig has 3 watts of r-f output at the transmitter, 60 feet of RG-58/U coaxial cable, an SWR of 2.0, and a beam antenna having +11 dB gain. These figures add up as follows: (+4.8) + (-1.32) + (-0.5) + (+11) = +14 dBW. Using Fig. 1, this converts to 25 watts of equivalent power. Improvements in the transmission system by lowering the SWR or changing the cable to RG-8/U might raise the figure from +14 dBW to +15 dBW (effective radiated power of 32 watts). Note that this would only improve the received signal strength by 16% which is not enough to make that much difference, though every little bit helps. For CB'ers and hams, the best thing to do is to use a directional high-gain multi-element beam antenna. Antennas of this type provide a dramatic improvement in transmission and also assist in reception. Since a beam antenna concentrates the energy (for both transmission and reception) in a "tear-drop" pattern, with the sharp end of the pattern at the antenna proper, it focuses most of the transmitted energy toward the receiver at which it is aimed and also provides much less pickup in the other directions. This means a considerable reduction in the pickup of unwanted Signals. By properly aiming the antenna, distant transmission and reception are considerably improved. In some situations, it is necessary to connect the SWR bridge at the junction of the transmission line and the transmitter. 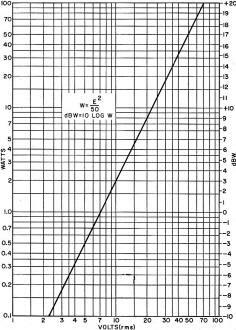 Indications obtained in this manner must be corrected for transmission line losses, with the curve in Fig. 2 used to convert SWR to dB of reflected power. Since the transmission line losses affect the SWR in both directions, the effect is to double the dB correction. Thus, if the SWR at the transmitter is 1.6, the reflected loss is 0.2 dB. If the line losses are 1.0 dB each way, the total for SWR correction is 2.2 dB.